It is said that Dragons may not reach full maturity until they have lived for more than a thousand years. The original Drako Garra was born in 2017 but, like a great silver dragon, it continues to grow and evolve beyond its original capabilities. 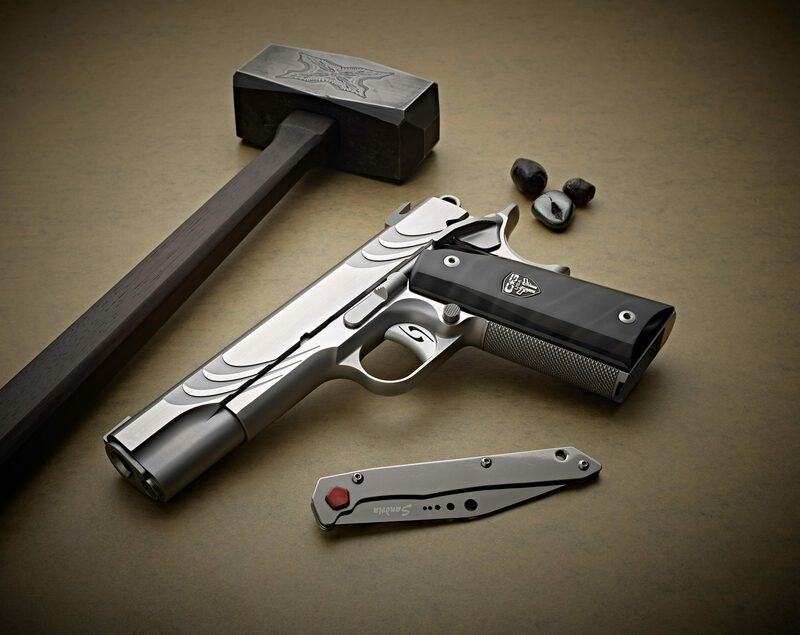 Cabot Guns is proud to introduce a new, even more magnificent iteration: the Drako Garra 2.0. In the complex hierarchy of dragonkind, silver dragons are among the wisest, most powerful, and longest lived. Yet even the majestic silver wyrms must pass into Twilight and beyond. Some seek to cheat death and extend their time within the mortal coil. Those who are successful create and inhabit an inanimate object known as a phylactery. Upon its physical death, the dragon’s spirit enters the phylactery, where it awaits an opportunity to take on a living form once more. At first glance, the Drako Garra 2.0 is reminiscent of an enchanted phylactery. 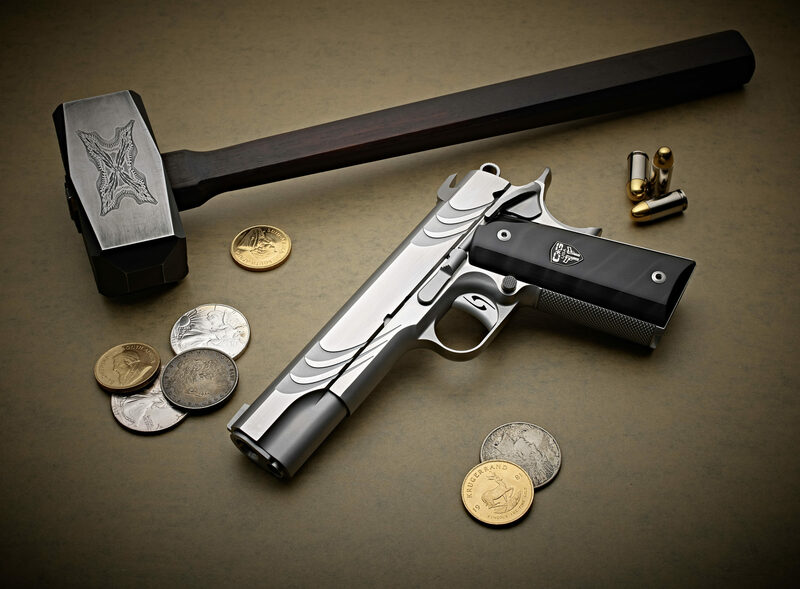 As the eye follows the elegantly curved lines, it is easy to imagine the spirit of Drako, the legendary silver wyrm, raking his razor-sharp claws down the slide and along the frame as his spirit entered this beautiful 1911 pistol. In reality, these striking forward and rear cocking serrations are a masterpiece of precise machining. And almost as if one dragon’s claw was not fully immured, the thumb safety lies perfectly aligned with the rearmost claw mark; a strong reminder that it takes only a thought and a touch to set Drako free. Before becoming one in spirit with the Drako Garra, the ancient dragon’s barb-tipped wings must have folded upon themselves and etched deep, arrow-straight grooves along the top of the slide. So precise are these parallel indentions, they too bear fraught witness to Drako’s strength and power, straining to break free. The imposing, slightly curved fangs of the silver wyrm are invoked in the unique, one-of-a-kind trigger and the eyes—the penetrating opaline eyes—seem to stare out from the chatoyant carbon fiber grips, newly designed for the Drako Garra 2.0. As one moves, Drako’s centuries-old eyes follow. Waiting, watching, seeking the perfect moment to strike and claim a new body for his own. To hold the Drako Garra 2.0 is to yearn to unleash its power. Extend it in front of one’s eyes and behold the upsweep of the newly designed rear sights. Imagine riding atop Drako’s muscular spine and gazing at your helpless target over and through arching scales that protect the piercing eyes of the feared silver beast. Align the graceful rear aperture with the matching front blade and guide Drako to unleash his fire. Take a breath as the wind whips around you. Release it and feel the power of perfection as you caress the Cabot’s gently radiused, precision-fit trigger, your hand firmly held in place by the Cabot-unique 24 line-per-inch rhombus checkering along the grip’s front strap and mainspring housing. Exhilarate to the sight of dragon flame. Feel the inexorable pull of Drako’s claws actuating the slide, so smoothly one could be forgiven for believing it rides on rails of molten silver. Like a powerful dragon in full flight, all the lovingly crafted components of the Cabot Drako Garra 2.0 —from Cabot’s perfected national match-grade barrel to bushing fit and lock up, to the full length guide rod, to the firm comfort of the grip safety nestled beneath the rakish skeletonized hammer—bear witness to the fate of one’s target. Beautiful, dominant, regal: Legendary. This is the promise of the reborn Cabot Drako Garra 2.0. Legends are the oral capture of heroic action which are passed from generation to the next. Gifts of auditory amazement cradled in the deep respect of reverence. They protect our culture, preserve our heritage, and celebrate our greatest champions. 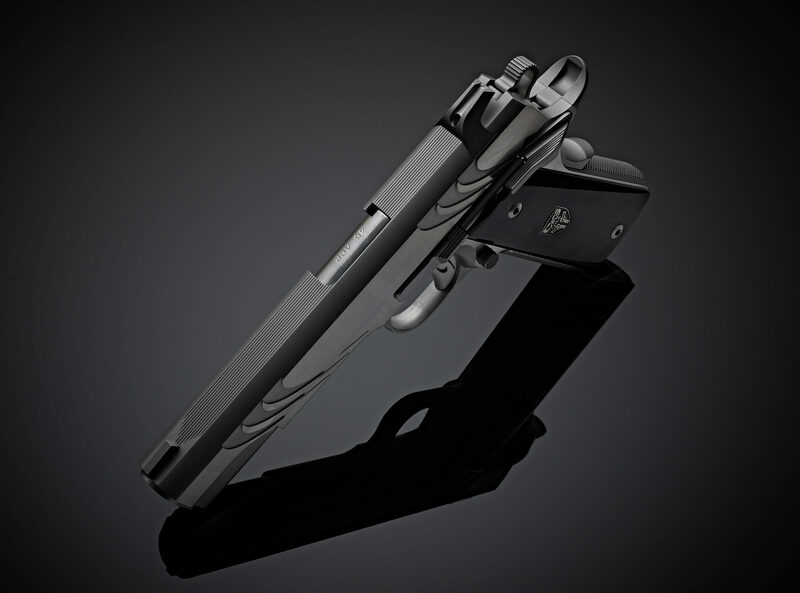 To properly honor the legend of Drako Garra, only the finest of cases – forged with the same pride and precision as the pistol itself would do. Turning to the able hands of a living Dragon-Slayer, Cabot Guns teamed with Jimmy J. Hintzke to craft a chest befitting the legend of the Drako Garra. His All-American and family-owned business – Valhalla’s Forge – was birthed following a 30-year Navy career spent defending the United States and its interests as a quiet-professional. Crafting only the finest for presentation to Presidents, other senior officials, and in memoriam of the departed defenders of our nation, Jimmy’s work has been quietly lauded in a community with impossibly high standards. An optional accessory to the Drako Garra, the hand-crafted mahogany and iron chest bears the scorch marks of the artisan’s flame and scars of his supreme craftsmanship. The same claw markings precision-cut into the trigger of the Drako Garra are repeated again on the lid, inlayed in American steel. The defining addition to any Drako Garra purchase, Jimmy’s master-level work begs to be displayed. Display case is optional and can be customized for you. Please contact Jimmy Hintze at Valhalla’s Forget directly.